If you’ve been reading the site for a little while, you probably know this by now, but if you’re new, here’s the deal: I’m a huge fan of the Monster Hunter series. 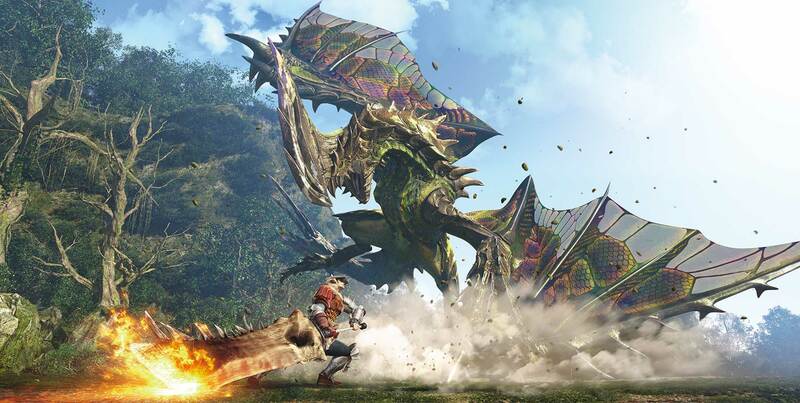 I’ve been increasingly more dedicated with each new game, and for all intents and purposes, I’ll do the same with Monster Hunter: World, by far my biggest surprise at this year’s E3, the very thing I’ve been asking for for so long: a Monster Hunter for consoles (and, uh… PC). Don’t get me wrong, though. I’m a huge fan of the portable entries in the series, but it just so happens the small control surface of the 3DS is a killer on my hands. They eventually force me to put it down after longer sessions so I can recover from the numbness that comes with the intensity of playing Monster Hunter. It’s an incredibly busy game that requires constant inputs; after years of playing just about every peripheral and console that’s been put out on Earth, my hands just cry about “hey, gimme us a break, son!”. I was able to catch a peek of the Monster Hunter: World presentation on the last day of E3. I was already pretty pumped after watching its announcement trailer during the PlayStation press conference, although it didn’t show a whole lot of gameplay. The scheduled demo did, however, and it was great. World feels like a bonafide Monster Hunter experience on a much bigger scale. So much so that the presentation really shook the beehive and had not only one or two named boss monsters fight among themselves, but three. But before all of that, there was the starting part of the demo, where our hero hunter was going after a single target, tracking it all around a jungle environment that like the levels in the portable versions of Monster Hunter, was divided into sections, but differently from those, the transitions between those looked completely seamless as the hunt progressed. In order to track the monster down, our hunter used hints left by the creature, such as claw marks. Our prey also had a particular scent which just happened to be how one of World’s new items, scout flies, was able to lead us to it. After some battling, the beast started doing the trademark Monster Hunter thing of running away to rest up and heal, he was able to find his way to it; but not before changing to another, more suitable gear set — a heavy bowgun/heavy armor combo — back at camp, from the longsword he was using before. I’m terrible putting names to monsters in Monster Hunter — I freely admit that as a flaw even though I’m big fan of the franchise — so it’s difficult for me to name all of the monsters that eventually got down to the rumble near the end of the demonstration. Once our prey was ready to finally die, a dragon swooped out of nowhere and started munching on it, ignoring the hunter completely. That lasted for a few moments until yet another beast barged in — what looked to be another species of the dinosaur creature the dragon was having his lunch of — and it also decided to fight. Once the dust settled and the presentation was almost over, somehow our original target was felled for good, and the hunter was able to happily skin it. Chaos like that is classic Monster Hunter. It’s still hazy whether or not something similar could happen naturally in the final build of the game, or if it’s a scripted thing, but regardless,, seeing it all unfold in such a scale was certainly something else. 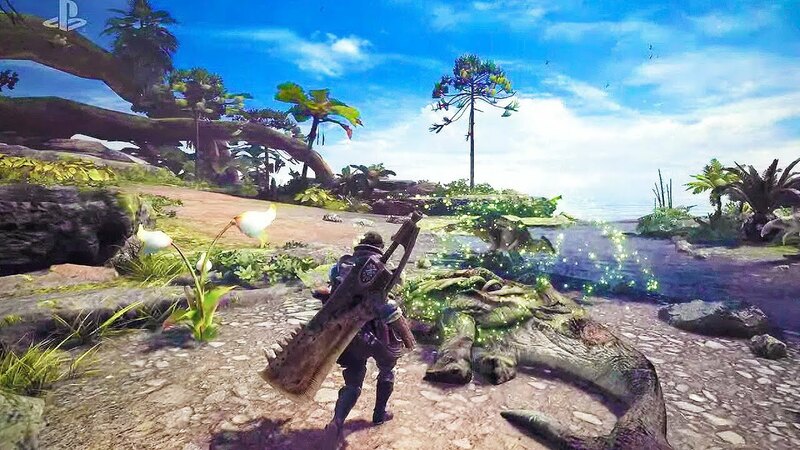 Considering that practically all we’ve seen of Monster Hunter over the past generation has been on tiny screens, having one of these games finally make the leap to console as a full-fledged game (and not a port like the Wii and WiiU versions of Tri) gives Capcom a lot more to work with. There’s still much we’ve yet to know about Monster Hunter: World, such as how much of it will rely on online play. Other than being able to call in help if tackling a mission solo proves to be too much for you, there’s currently no indication of how lobbies would work, or even if they’ll exist in the same way they do in the current version on 3DS. Capcom offered a 4-player multiplayer test station at their booth, sadly I was unable to jump in and play. Either way, there’s bound to be a lot more info to come about this as it gets closer to release. Things are already looking very, very good. Monster Hunter: World is coming out for the first time ever simultaneously worldwide in early 2018 on Xbox One and PlayStation 4, with a PC version soon to follow.